The preorder for the iPhone 5S and 5C starts today in selected countries including Singapore, U.S., U.K., and China. Everyone expected the iPhone 5C to be a “budget iPhone” or the “iPhone 5 Cheap” but that didn’t happen, instead, it’s a replacement of the iPhone 5 with a slightly cheaper price, while the iPhone 5S is the same or even more expensive than the iPhone 5 at launch in some countries. How much will it cost when it gets launched here in Malaysia? 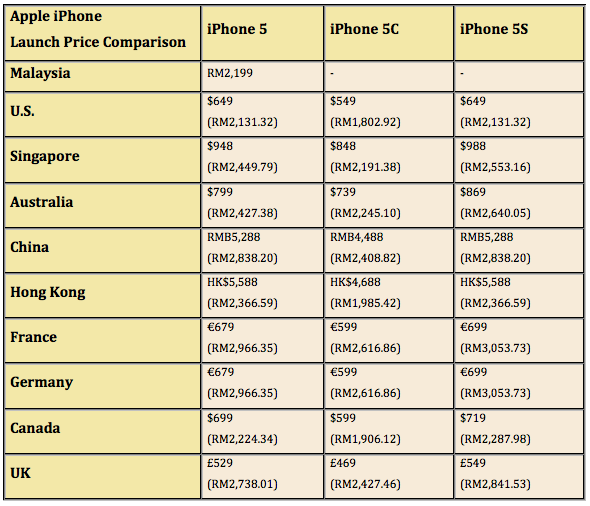 We like to compare the price to Singapore since it’s just right next to us, but with the bizarre currency exchange rate of almost SGD1 to RM2.6, to convert directly would only result in a very scary figure, so let’s take a look at the iPhone 5C and iPhone 5S launch price from around the world, compared with the iPhone 5. It seems like Apple is being pretty inconsistent here, the iPhone 5 vs iPhone 5S price is same in other countries while the iPhone 5S is a little more expensive in the rest. Europe, as usual, has got the most expensive choice of all. But how much will they cost when being introduced into Malaysia? Judging from the iPhone 5 pricing, I would have to guess that the iPhone 5S would have the same at RM2,199. As for the iPhone 5C, I personally would guess that it would start from RM1,899. Apple has this thing about RM300 price difference for each tier of their devices, the iPhone 5 16GB costs RM2,199, 32GB at RM2,499 and 64GB at RM2,799, so my guess for the 5C would be RM2,199 minus RM300. Of course, Apple still has plenty of time left to make that decision. The iPhone 5 only made its way to Malaysia in December last year and I think this time round, things will be the same. The next launch event might be happening in other parts of the world, ZDNet spotted 6 new countries that the devices may be heading – Switzerland, Belgium, Netherlands, Scandinavia, Sweden and Norway. What’s your take on the iPhone 5S and iPhone 5C pricing in Malaysia? Let us know in the comments.